While Wesley takes his Starfleet entrance exams, Picard and his crew are grilled by Lieutenant Commander Remmick from the Inspector General's office, who is convinced he can find something wrong with the Enterprise. I'm not sure that Mordock's species even has a word for "cute." Remmick acts like he has a personal stake in the investigation. I wonder what his story is. I like that Wesley gets advice from Worf. It's a neat scene, and one of Worf's first chances to be an interesting character. Remmick brings up Picard's violation of the Prime Directive in "Justice." I actually agree with Remmick that it's a hard one to justify. When Admiral Quinn tells Picard he wants him leading the Academy, you can see the look of dread on Picard's face, as though he's thinking, "How can I possibly deal with all those kids?!" While Wesley's busy facing his greatest fear, you have to imagine Picard is, too. We get a little taste of the backstory involving Picard and Welsey's father. 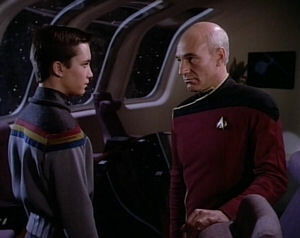 It's hinted at early in the episode when Remmick states that Picard is responsible for Mr. Crusher's death, but then it is clarified when Welsey explains that Picard had to make a choice that resulted in his father's death. Backstory is good, and so far, getting it for most of our characters has been like pulling teeth. Though we've been given nuggets of information about Wesley, Troi, Picard, and Data, we still know very little about the pasts of Worf, Yar, La Forge, Riker, and Dr. Crusher. This episode sets up a lot of things, especially "Conspiracy." It's probably the first episode to foreshadow things to come, and thus the first experiment in serialized storytelling in the Star Trek canon. It'll still be a few years before storylines take on a life of their own, and it isn't until late in DS9 that the entire show gets taken over by a single, overarching storyline (The Dominion War, in that case). As the franchise evolves, it gets more complex and interconnected, moving away from the episodic. That evolution starts right here. At the risk of writing something truly corny, you could see this episode as TNG's first stab at "Coming of Age." It would have been really interesting to see Remmick as a new crewmember, like perhaps a replacement for Yar as head of security, and to see how the crew react to him. Alas, he gets infected by an alien hive queen and has to have his head exploded. Besides, it's hard to imagine anybody but Worf being head of security. Picard says he's not good at politics, but I don't really believe him. The only captain from the shows who might be a better politician than Picard would be Janeway, but if you compare him to Kirk, Sisko, or Archer, there's just no contest; Picard would be the most politically saavy. I really love how they develop the relationship between Wesley and Picard. It almost makes up for how annoying Wesley is in every other respect. We eventually do see what kind of Academy Commandant Picard would be like in "The First Duty." That episode is also the culmination of the Picard-as-Wesley's-surrogate-father story thread that is developed in this episode.